Constellation Draco the Dragon, is a northern constellation coiling around the north pole. 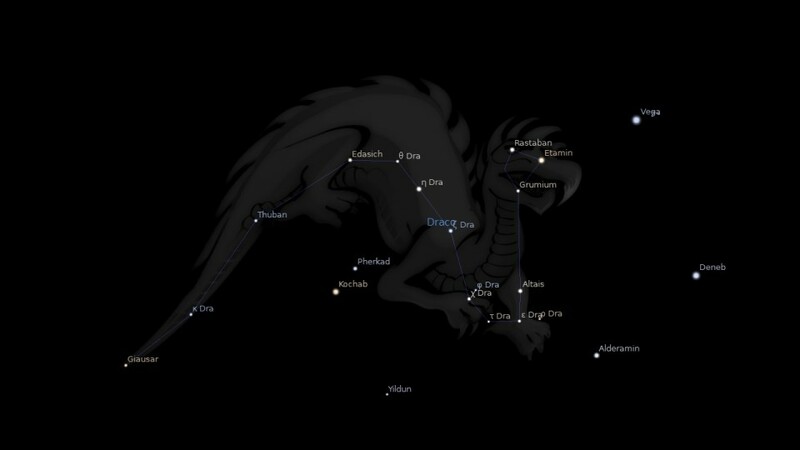 Draco spans over 250 degrees of the Zodiac from the Signs of Aries to Sagittarius, and contains 18 named fixed stars. Draco represents the dragon that guarded the golden apples in the garden of the Hesperides. According to other accounts, however, it is either the dragon thrown by the giants at Minerva in their war with the Gods, or the serpent Python slain by Apollo after the deluge. Draco, the Dragon, circles around the North Pole. 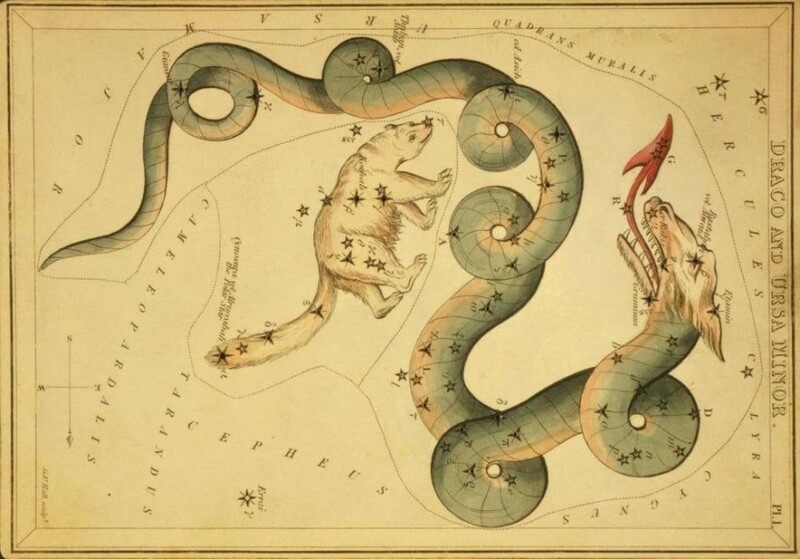 It was described in the Shield of Hercules, with the two Dogs (Canis Major and Canis Minor), the Hare (Lepus), Orion, and Perseus, as “The scaly horror of a dragon, coiled Full in the central field”; and mythologists said that it was the Snake snatched by Minerva from the giants and whirled to the sky, where it became Sidus Minervae et Bacchi, or the monster killed by Cadmus at the fount of Mars, whose teeth he sowed for a crop of armed men. Babylonian records allude to some constellation near the pole as a Snail drawn along on the tail of a Dragon that may have been our constellation; while among the inscriptions we find Sir, a Snake, but to which of the sky serpents this applied is uncertain. And some see here the dragon Tiamat, overcome by the kneeling sun-god Izhdubar or Gizdhubar, our Hercules, whose foot is upon it. Draco’s stars were circumpolar about 5000 B.C., and, like all those similarly situated, — of course few in number owing to the low latitude of the Nile country, — were much observed in early Egypt, although differently figured than as with us. Some of them were a part of the Hippopotamus, or of its variant the Crocodile, and thus shown on the planisphere of Denderah and the walls of the Ramesseum at Thebes. As such Delitzsch says that it was Hes-mut, perhaps meaning the Raging Mother. An object resembling a ploughshare held in the creature’s paws has fancifully been said to have given name to the adjacent Plough. The hieroglyph for this Hippopotamus was used for the heavens in general; while the constellation is supposed to have been a symbol of Isis Hathor, Athor, or Athyr, the Egyptian Venus; and Lockyer asserts that the myth of Horus which deals with the Hor-she-shu, an almost prehistoric people even in Egyptian records, makes undoubted reference to stars here; although subsequently this myth was transferred to the Thigh, our Ursa Major. It is said that at one time the Egyptians called Draco Tanem, not unlike the Hebrew Tannim, or Aramaic Tannin, and perhaps of the same signification and derived from them. Williams mentions a great comet, seen from China in 1337, which passed through Yuen Wei, apparently some unidentified stars in Draco. The creature itself was the national emblem of that country, but the Dragon of the Chinese zodiac was among the stars now our Libra: Edkins writes that Draco was Tsi Kung, the Palace of the Heavenly Emperor, adding, although not very clearly, that this palace is bounded by the stars of Draco, fifteen in number, which stretch themselves in an oval shape round the pole-star. They include the star Tai yi, xi, omicron, sigma, s, of Draco, which is distant about ten degrees from the tail of the Bear and twenty-two from the present pole. It was itself the pole in the Epoch of the commencement of Chinese astronomy. The Serpent represents him as the Deceiver; the Dragon, as the Destroyer. No one has ever seen a dragon; but among all nations (especially in China and Japan), and in all ages, we find it described and depicted in legend and in art. Both Old and New Testaments refer to it, and all unite in connecting with it one and the same great enemy of God and man. In the Zodiac of Denderah it is shown as a serpent under the fore-feet of Sagittarius, and is named Her-fent, which means the serpent accursed! There are 80 stars in the constellation; four of the 2nd magnitude, seven of the 3rd magnitude, ten of the 4th, etc. The brightest star α (in one of the latter coils), is named Thuban (Heb. ), the subtle. Some 4,620 years ago it was the Polar Star. It is manifest, therefore, that the Greeks could not have invented this constellation, as is confessed by all modern astronomers. It is still a very important star in nautical reckonings, guiding the commerce of the seas, and thus “the god of this world” is represented as winding in his contortions round the pole of the world, as if to indicate his subtle influence in all worldly affairs. 1. Fixed Stars and Constellations in Astrology, Vivian E. Robson, 1923, p.43. 2. Star Names: Their Lore and Meaning, Richard H. Allen, 1889, p.202-206. 3. Astronomica, Manilius, 1st century AD, book 1, p.30, book 1, p.27. 4. The Witness of the Stars, E. W. Bullinger, 15. Draco (the Dragon cast down). Very well researched. I enjoy reading your blog!